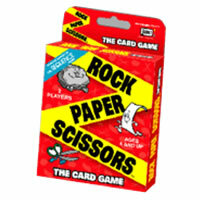 Rock Paper Scissors card game is a new version of the timeless classic played by many kids. In the game Rock Paper Scissors each player lays down a card. The player whose card is better then gets the cards. When all the cards have been played the player with the most cards wins. Test your luck in this game of rock, paper, and scissors. Rock tops Scissors, and Scissors top Paper, but Paper tops Rock. Check out Rock Paper Scissors card game today and see how your luck holds out. Collect as many cards as possible. Rock Paper Scissors game includes 54 playing cards and Rock Paper Scissors official rules and instructions. Please keep in mind that the official Rock Paper Scissors childrens rules and instructions could be different depending on the game version you have. The rules below are some of the exact directions on how to play Rock Paper Scissors. Share with us your comments, funny stories, tips, advice, strategies, creative ways to play, questions about how to play, problems with the rules or anything you want about Rock Paper Scissors. All submissions will be reviewed within 24 hours. Click here to add your Rock Paper Scissors comments. I've been trying to play and teach my daughter paper rocks scissors but she can't quiet grasp the timing of when to change your hand. Having cards will really help and make it easier for her. Same rules just less to worry about. I was a little disappointed by this card game since it was exactly like the hand game except with cards. No need to buy it if it's no different.